Consider the Barreleye, a deep-sea fish named for its two long, cylindrical eyes pointed directly upwards towards the water’s surface. These googly eyes are covered by a clear, membranous dome, giving the fish the distinct look of some unhappy alien, stuck in a space suit, drifting along listlessly on its back. These aesthetic quirks are not what make the barreleye interesting; it is what is inside the eye. The Barreleye uses tiny microcrystals in its eye to reflect light back into the retina, acting as little mirrors collecting every trace of ambient light. It is the only known animal to use mirrors to see. 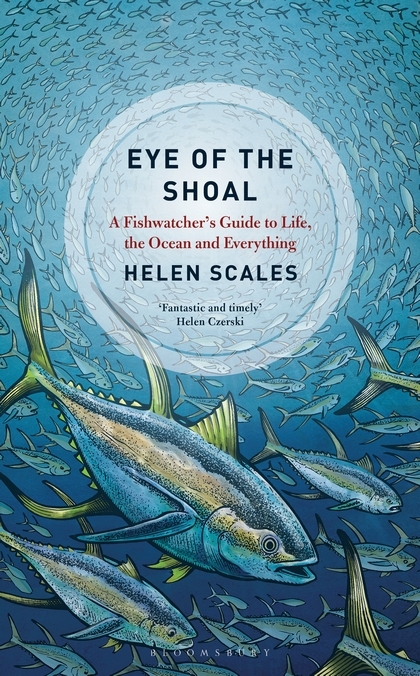 The Barreleye is just one of the many strange, finned beasts we meet in Helen Scales’ new book, Eye of the Shoal, which takes a wide ranging, deep diving look at the fascinating history and biology of fish. Eye of the Shoal focuses not on a particular underwater ecosystem or community, but a hodge-podge of fishy players exquisitely adapted to fill every watery nook and cranny across the globe. Scales makes a compelling case for looking closely at any fish that crosses your path; although many of the characters we meet live in the reef, she makes sure to give the residents of your local fish tank their due. In Eye of the Shoal, Scales brings us into the rich, diverse, glorious world of fish full tilt—and has a good time doing it. Eye of the Shoal is the story of fish told through their evolution, their diversity, their colors, their communication, and their intelligence. Scales, a veteran science writer and lecturer at the University of Cambridge, has a knack for meshing storytelling with scientific insight. In one section, she brings us into the complicated inner life of a cleaner wrasse, a small, blue-streaked reef fish, which makes a living cleaning parasitic crustaceans off the bellies of fish and picking gunk out of the teeth of normally vicious predators. The wrasse’s customers line up around the metaphorical block to get a lippy scrubbing down by the cleaner wrasse, many returning multiple times a day. Although the wrasse mostly subsists off of his customers’ unwanted detritus, he would much rather take a big nutrient rich bite of fish flesh instead. If the wrasse becomes known as a flesh-eater, however, he will be distrusted and lose his customers. Scales walks us through the complicated social dynamic that controls the wrasse’s business—when can he take a chance for a fleshy bite? Which clients will continue to patronize his business given this breach in social contract? Navigating this complex social exchange “requires a surprising amount of brainpower”, Scales points out, and the reader is sure to come away with a deeper appreciation for this fish’s non-human intelligence. Helen Scales, breaking down species bias one fish at a time. Within the larger structural framework, Scales leaves plenty of room for animal rarities and oddities. We meet the Pacific and Atlantic herring, which are “the only animals known that communicate with flatulence.” We meet the long-lived Greenland Sharks, who “may mate for the first time when they’re 150 years old.” We meet fish who scuttle between ponds (the Walking Catfish) and fish who live for months out of water (the Mangrove killifish). We meet the beaky parrot fish, which have “a second set of teeth at the back of the throat” used to grind up between four and six tons of limestone a year, building veritable islands out of their poo. Scales highlights these “fish stories” to make a bigger point about fish, their diversity, their lives—but she also brings a feeling of genuine glee to all her interactions with these weird and wonderful animals. Although Scales does not explicitly set out to make a statement—about global warming, loss of habitat, overfishing, or any of the other slow motion ecological disasters affecting fish—any book on the topic of fish and their many environs would have a gaping hole without mentioning how humans have impacted their water-bound neighbors. The most touching of these examples is a personal anecdote from Scales, who studied a community of humphead wrasse in the South China Sea during her Ph.D. at the University of Cambridge. After spending years studying these fish and their complicated mating habits, she discovered that the entire community was fished out of existence shortly after she left her field station. “My efforts to study humpheads suddenly felt hollow,” she writes—and we, the readers, are left feeling hollow as well. If we come away from Eye of the Shoal caring more about fish and the ocean, it is not through overt messaging but through the genuine feeling Scales communicates. Eye of the Shoal is largely a fun romp through fishy space and time, but it does suffer from overreach. Summarizing the whole of fish science and history in 320 pages is impossible, and the attempt leaves the book, at places, weak in its connective tissue. In an attempt to emphasize the importance of fish throughout human history, Scales scatters fish-related myth and legend throughout the book—a conceit that frequently seems forced. In order to orient the reader in fish ancestry, Scales spends the first chapter climbing through the evolutionary tree of life, branch by laborious branch. Unfortunately, it drags. I sincerely hope this slow opening does not turn the reader off of Eye of the Shoal, as it is out of character with Scales’ normal carnivalesque approach to her subject matter. This entry was posted in Book Reviews, Current Articles by Sarah Baker. Bookmark the permalink.